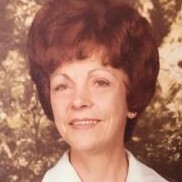 Glenis Paulene Thurman, of Hixson, went home to be with her Lord on Thursday, March 22, 2018. She was a member or Philadelphia Baptist Church. Glenis worked with her sister at Thurman Upholstrey for many years. She loved her family and enjoyed being a caregiver and spending time with children and grandchildren. Glenis was preceded in death by her husband, Frank Thurman and six siblings. Survivors are her sons, Howard Thurman (Eva), Barney Thurman (Nancy), Jimmy Thurman (Paulette); daughters, Frances Freeman and Wanda Brown (Ron); brother, Wendall Swafford (Mary Lou); sister, Edna Thurman; 9 grandchildren, 9 great grandchildren and 5 great great grandchildren; several nieces and nephews. Services will be on Saturday, March 24, 2018 at 3:00 p.m. in the funeral home chapel with Rev. J.T. Sanders officiating. Burial will follow at Winnie Cemetery. Visitation is Friday from 4:00 p.m. to 8:00 p.m. at the funeral home.